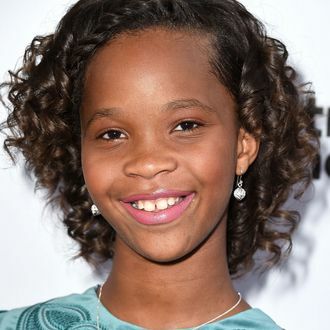 Quvenzhané Wallis continues to outshine most adults. The 12-year-old Annie star and Oscar nominee can now add author to her glowing résumé: She’s signed a book deal with Simon & Schuster that’ll have her publish four books in just over a year. She’s set to release a three-part Judy Moody–inspired series that follows third-grader Shai Williams, another young “star in the making who has a flair for the dramatic … both onstage and off.” The first book will be published January 2017, with the next two installments coming fall 2017 and summer 2018. In addition to that series, she’ll also release a picture book that’s loosely based on Wallis’s life in the spotlight about a “spunky young heroine who is very much looking forward to a night out with her mom at an awards show.” That book is expected for fall 2017, to be released in tandem with the second part of her series. What have you done lately?